Packed with Qualcomm Snapdragon octa-core processors (for Lenovo VIBE K5 Plus) and a Premium 64-bit Helio octa-core processor (for Lenovo VIBE K5 Note), both smartphones redefine “fast and furious”. Both capture the best photos and play the finest videos: aside from having a 13MP rear camera, both feature frontal cameras- an 8MP fixed-focus front camera for the Lenovo VIBE K5 Note and a 5MP front camera for Lenovo VIBE K5 Plus- to help users have more fun with selfies. Lenovo VIBE K5 Plus and Lenovo VIBE K5 Note retail at Php8, 999 and Php11,999 respectively. 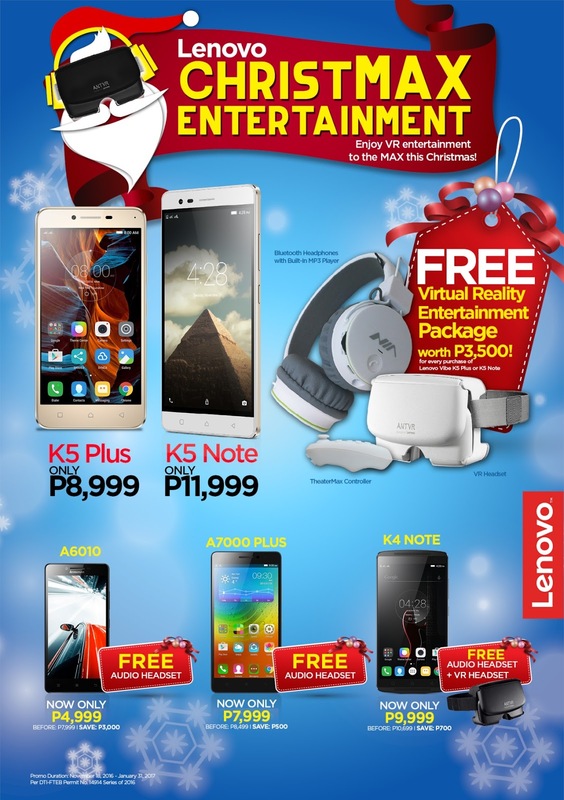 And with Lenovo’s ChristMax Entertainment promo, both come with a free virtual reality entertainment package worth Php3, 500 from Lenovo: this includes a VR Headset, VR Controller, and Bluetooth headphones with built-in MP3 player. Lenovo has also slashed as much as Php3,000 off the price tag of some entry-level Lenovo smartphones. 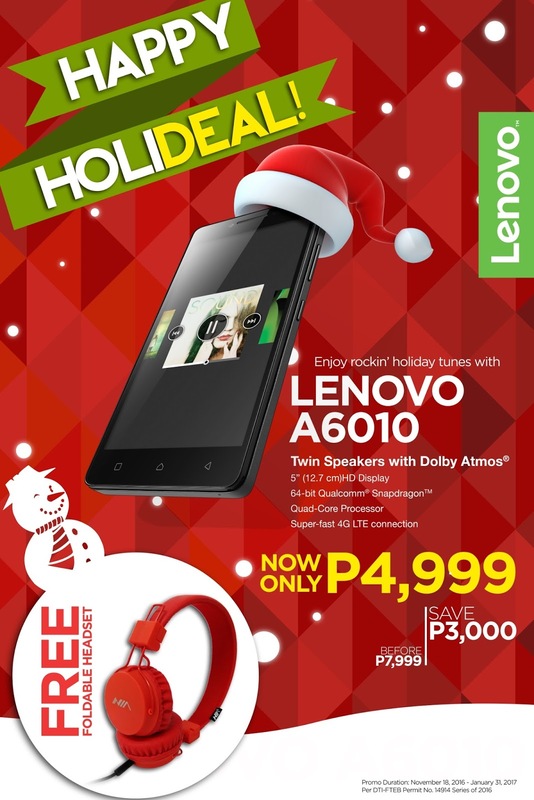 Lenovo A6010, which boasts of Dolby Atmos Twin Speakers, now retails at Php4,999, down from its original SRP of P7,999. Lenovo A7000 Plus, which delivers an immersive 360-degree sound with Dolby Atmos technology feature, is now priced at Php7,999 instead of Php8,499; and Lenovo VIBE K4 Note, one of Lenovo’s first Virtual Reality Technology-enabled smartphones, is now priced at Php9,999, down from Php10,699. All three smartphones come with free audio headsets. Lenovo VIBE K4 Note additionally comes with a free VR headset for a more immersive virtual reality experience. Aside from gift giving, Christmas is also a season to keep up with fashion trends. It is the time to strut those fun and festive holiday #OOTDs after all. Lenovo’s Merry Trendy Christmas promo got fashion lovers covered in this area, thanks to its partnership with popular local clothing brand, Bench. 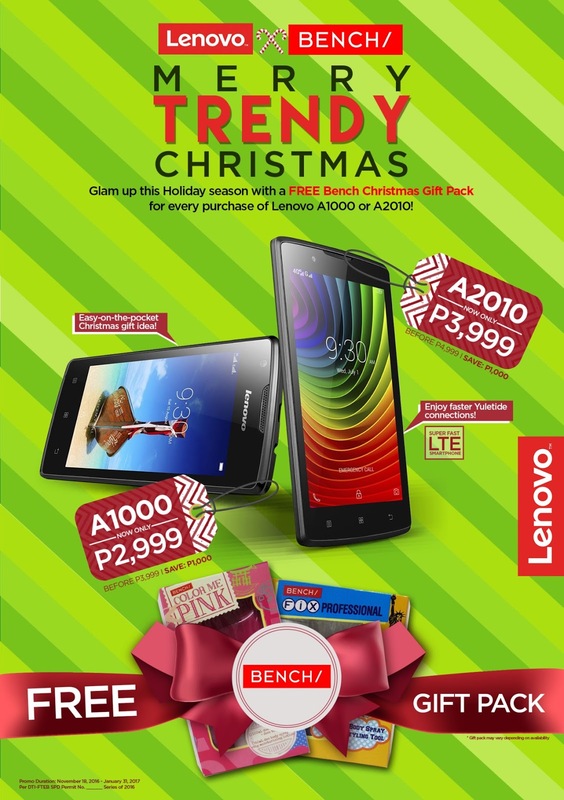 Those who purchase Lenovo A1000 or Lenovo A2010 at discounted prices of Php2,999 and Php3,999, respectively, can bring home a free Bench gift pack. And since these smartphones come cheaper by Php1,000, fashionistas also have more money to spare to complete their trendy Christmas #OOTD. The Lenovo Holiday Promos run from November 18, 2016 to January 31, 2017. Walk-in customers will automatically get a corresponding discount and freebie when they purchase select Lenovo smartphones in participating Lenovo Mobile Exclusive Stores, Lenovo Mobile Exclusive Kiosks, Lenovo Exclusive Stores, and authorized dealers nationwide.